This resource guide we have put together for you will give you a very nice clear logical roadmap for you to follow. STEP #1- Request a free copy of our "How to Get Started In The White Dove Release Business" publication. I like to reward the action takers since this process is specifically designed for only the serious that are ready, willing, and able to get started in this business. STEP #2- After you have read and gone through step #1, request to have a 15 minute strategy session, and or consultation. v WHO: White Dove Sales (A sister company of United Doves L.L.C.) provides their existing and new customers all the necessary equipment, supplies, birds, literature, and expertise necessary to get YOU started in The White Dove Release Industry. 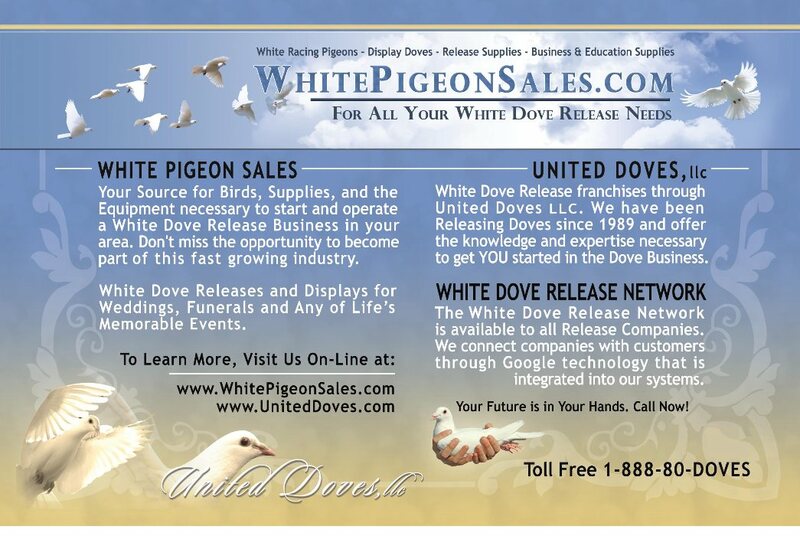 We have been in this business since 1989, and are the largest and Oldest Successful White Dove Release Supply Company on the entire Internet!! A private firm backed by knowledgeable Staff with years of first hand direct “specialized” experience and expertise in this industry that you won’t find anywhere else, except right here on our website. We are ready to serve you as soon as you are ready to get started in the business. v WHERE: Headquartered now outside of Salt Lake City, Utah. We have continuously gained new customers worldwide on a weekly basis, but our primary focus is within the United States. We have a very large customer base which is spread throughout all the 50 States, in addition to a gradual growing customer base in Europe and South Africa as well.